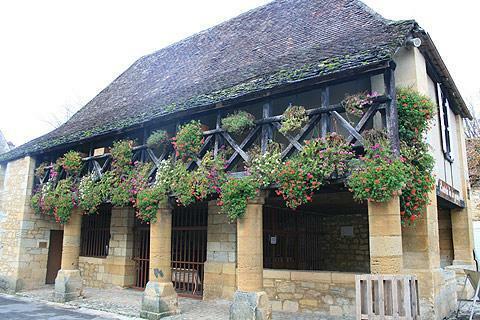 The village of Domme is on the Dordogne river eight kilometres south of Sarlat, and listed as one of several 'most beautiful villages of France' in the Dordogne department. 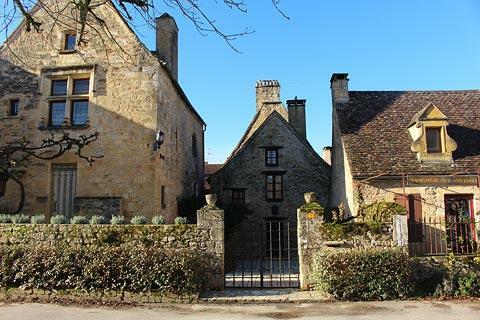 It is a very attractive bastide town, founded in 1283 and situated in an exceptional hilltop location. Domme had an unstable early history, and changed hands several times between the English and the French during the Hundred Years War. The turbulent times continued in the later Wars of Religion, and even as recently as the Second World War the caves in the centre of Domme were used as a hideout. 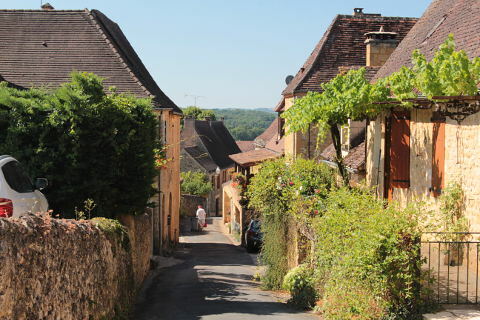 France This Way comment: although it is quite small, Domme has many lovely houses, an impressive cave system and amazing views across the countryside so a visit is very recommended! 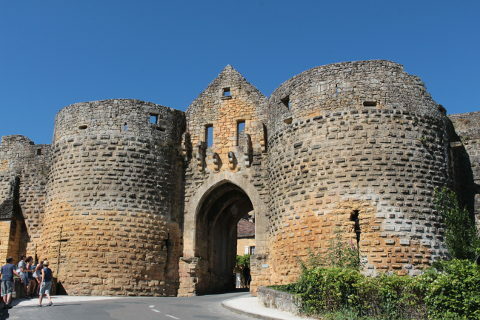 The town is entered by a large fortified gate at the bottom of the main street: it is unusual for a bastide town to retain its fortifications as Domme has done. The huge towers either side of the entrance called La Porte des Tours once served as prisons and you can still see the religious symbols scratched like graffiti on the walls by the Templar prisoners during the 14th century. Inside the fortified walls the main street then passes up the hill between lots of lovely honey-coloured old houses, now mostly used as gift shops. 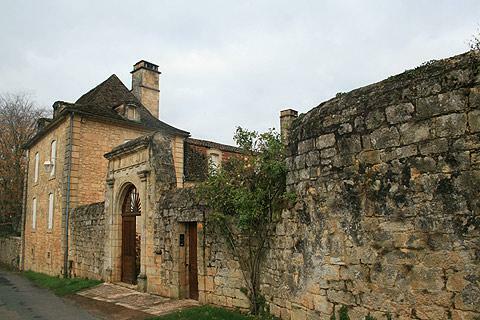 Some of the traditional houses in Domme are also attractively decorated with balconies and external stone staircases. 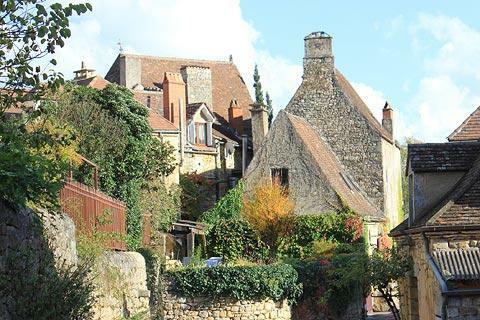 As you walk along the street you can also stroll into the small streets to either side where you will see more of the attractive cottages and their gardens. 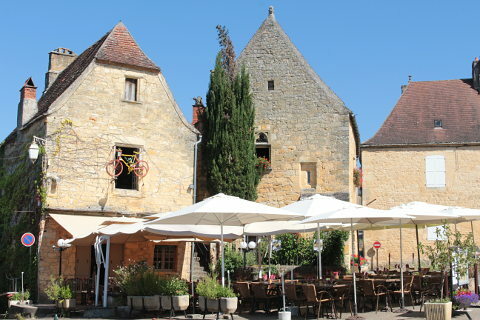 At the top of the hill you reach a large open area with several cafes, and the entrance to Domme caves. 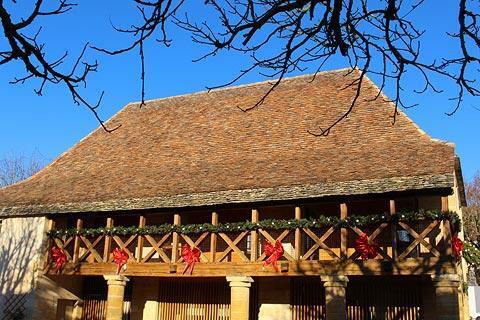 The original open market hall, with impressive carpentry and stone supporting pillars, is in this square and overlooked by the imposing 15th century 'Hotel du Gouverneur'. The position of Domme at the top of a fairly steep hill is a large part of why the village is so special. 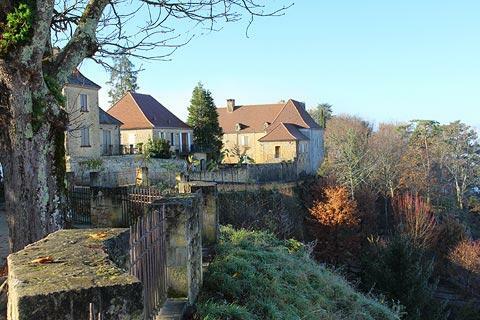 There are 180 degree views across the Dordogne river and surrounding countryside from the terraced belvedere area at the top of the village, from where you can also see other picturesque villages including Beynac and La Roque Gageac. You will certainly want to visit one of the cafes here which are in a very pleasant place to recover from the hill and the heat. 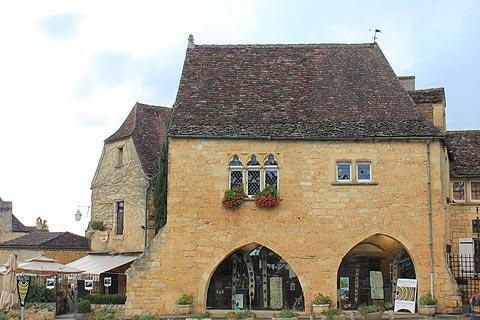 There is a small museum of arts and popular traditions in Domme called the 'Oustal du Périgord' where you can learn about the typical lives of the locals over the last two centuries. Entered in the centre of the main square, Domme caves themselves are a noteworthy attraction. They are extensive and interesting caves, with almost half a kilometre of galleries containing carefully lit rock formations. 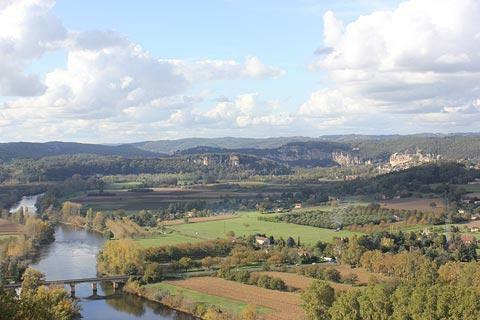 The largest caves in the Perigord Noir region, the visit finishes with a ride in a glass-fronted lift up the cliff. Of course, visiting the caves is also a lovely way to cool down on a hot summers day. 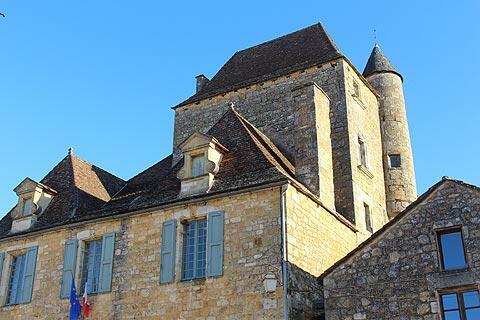 There are too many attractions close to Domme to list them here, with numerous castles and beautiful villages such as Beynac and La Roque Gageac, river and countryside scenery. 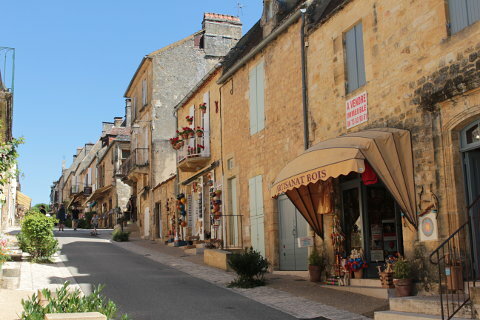 Sarlat, perhaps the highlight of a visit to the Dordogne, is just a few kilometres to the north-east of here. 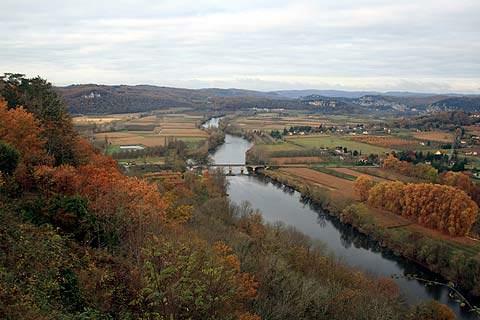 See our Dordogne travel guide for many more suggestions. 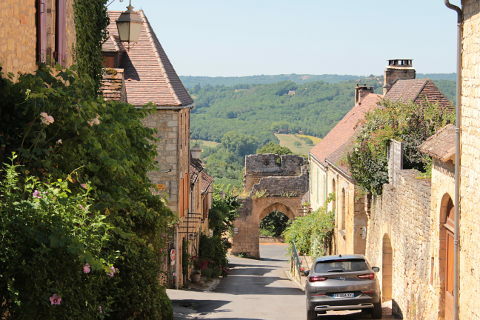 Much less known and less visited, we suggest you also explore the countryside to the south of Domme, and in particular the area around the villages of Daglan and Saint-Pompont.